FIGURE 2: Patterns of covariation between pCO2 and temperature (upper), oxygen (middle), and salinity (lower panels) in Hood Canal and Admiralty Inlet, Washington. Carbonate chemistry variability is often poorly characterized in coastal regions and patterns of covariation with other biologically important variables such as temperature, oxygen concentration, and salinity are rarely evaluated. This absence of information hampers the design and interpretation of ocean acidification experiments that aim to characterize biological responses to future pCO2 levels relative to contemporary conditions. Here, we analyzed a large carbonate chemistry data set from Puget Sound, a fjord estuary on the U.S. west coast, and included measurements from three seasons (winter, summer, and fall). pCO2 exceeded the 2008–2011 mean atmospheric level (392 µatm) at all depths and seasons sampled except for the near-surface waters (< 10 m) in the summer. Further, undersaturated conditions with respect to the biogenic carbonate mineral aragonite were widespread (Ωar<1). We show that pCO2 values were relatively uniform throughout the water column and across regions in winter, enriched in subsurface waters in summer, and in the fall some values exceeded 2500 µatm in near-surface waters. Carbonate chemistry covaried to differing levels with temperature and oxygen depending primarily on season and secondarily on region. Salinity, which varied little (27 to 31), was weakly correlated with carbonate chemistry. 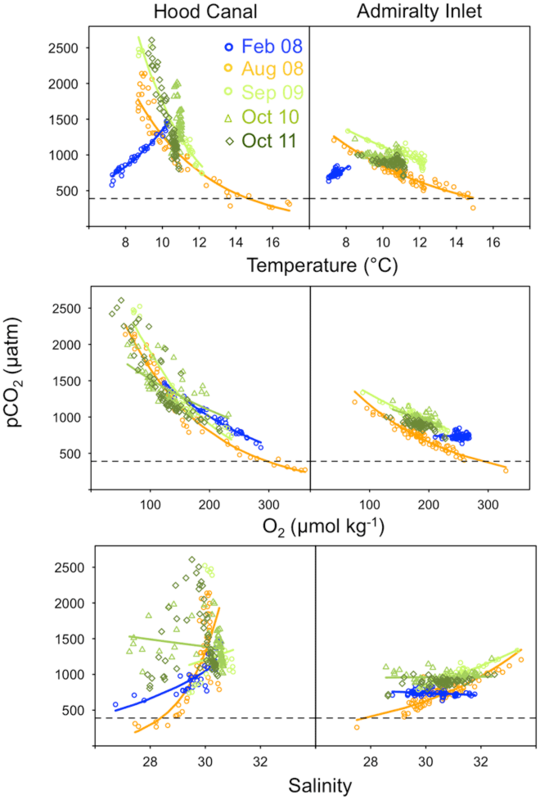 We illustrate potential high-frequency changes in carbonate chemistry, temperature, and oxygen conditions experienced simultaneously by organisms in Puget Sound that undergo diel vertical migrations under present-day conditions. We used simple calculations to estimate future pCO2 and Ωar values experienced by diel vertical migrators based on an increase in atmospheric CO2. Given the potential for non-linear interactions between pCO2 and other abiotic variables on physiological and ecological processes, our results provide a basis for identifying control conditions in ocean acidification experiments for this region, but also highlight the wide range of carbonate chemistry conditions organisms may currently experience in this and similar coastal ecosystems. Reum, J.C.P., et al. 2014. Seasonal carbonate chemistry covariation with temperature, oxygen, and salinity in a fjord estuary: implications for the design of ocean acidification experiments. PLoS ONE 9(2): e89619. doi:10.1371/journal.pone.0089619.